Due to the variety of applications and different formulas of Tiger Foam Air Sealant that are available, there are several formulas for determining the quantity of product required for the job. Read the general information about the spray foam air sealant kits, then calculate the amount of spray foam required for your project using the Slow Rise Formulas and Fast Rise Formulas. If you have problems calculating, simply call our sales office directly at 1-888-844-3736 and they’ll be happy to do the calculations for you. Tiger Foam’s Fast Rise (FR) is formulated for surface spraying. Use for air sealing open frame walls in new construction buildings, air sealing crawl spaces and basement ceilings, and air sealing metal walls. E-84 Fire Rated: Formulated as a value added product with additional self-extinguishing fire retardants. Used primarily where the foam is going to be exposed in commercial applications that require the E-84 rating be satisfied or additional fire safety is a consideration. The amount of spray foam required depends on your application. Measure your outside walls length x height to get your raw square footage. 36L + 20W x 2 = 110 x 8′ = 896 total square feet of wall area in the outside walls. Crawl spaces and basement ceilings, including rim joists are calculated at simple board footage. For instance, if your crawlspace is 20’x 30′, that equals 600 sq. ft. This air sealing job requires only one TF-600 kit to warm the floors and block draftiness from air infiltration coming up the walls from the crawlspace or basement. Tiger Foam is ideal to use for Metal Roof overhead application. Example: You have a 20′ x 30′ metal building with 10′ walls. If you are doing the ceiling also, it’s 20’x 30′ = 600 sq. ft. Add that total to 1,000 sq. ft of walls and you need to cover 1,600 sq. ft. Three of the TF-600 kits will do that, even allowing for a 3:1 pitch in the roof. Unless your Hot Tub or Spa is for more than 8 people, a TF-200 kit will do it. 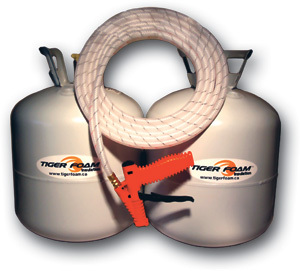 Tiger Foam’s Slow Rise (SR) pour in place formula is a low-expansion foam that is made to expand slowly and fill boat hulls, pontoons and flotation devices or anywhere injected foam can be used. filling liquid tanks with foam for EPA mandates, flotation devices, etc. You really need to put a heat source on these tanks to get the maximum yield. A ceramic heater or electric heater with a fan works well. The warmer they are, the better the yield. If you don’t keep the tanks warm, you will not get the yield out of the kits and will run out of foam. It’s a basic bell curve. Maximum yield is achieved when tanks are between 75 and 85 degrees. If you were doing a large project, it would pay to invest in an Infrared thermometer because if the TF-600 gets below 70 degrees, you can lose 30% of the yield, so the thermometer would be a good investment. If the chemical temperature gets any lower in Temperature, the foam may not expand and will run. BEST BET: Put a heat source of 70-85 degrees (24-29 C ) on these kits for approximately 1-2 days before you use them and remember they need to be properly warmed to get the maximum yield. This foam expands and adheres great within its prescribed temperature ranges. KEY WORDS: WARM TANKS UP! You don’t have to keep heat on them while you are spraying. Get them properly warmed just before you start and, unless it’s below 20 degrees C out, they won’t cool down in the time it takes to spray a kit. A little common sense when using these kits really makes them work well. These kits are a dream to use in the summer, but they do take special attention to surface, ambient, and chemical temperatures in the cooler months. We appreciate you taking the time to understand this.